Ken explains the benefits of investing in a professional CFO. 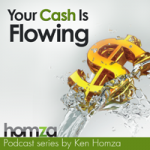 This entry was posted in Podcast Series: Your Cash Is Flowing by Ken Homza. Bookmark the permalink.